Grazing Rights Key Fix Range Conflicts in West | RANGEfire! In January 2016, an armed militia group seized control of the Malheur National Wildlife Refuge in eastern Oregon. Their goal: to protest federal control over western rangelands. It’s the latest episode in a long history of conflicts over the use of federal lands in the West. Reposted from Free Range Report. For a few short weeks during the spring of 2014, the intricacies of the U.S. federal grazing system garnered national attention. Major newspapers ran front-page stories. Television crews rushed to cover the issue live from the western range. Cable networks broadcast videos of cattle grazing on the evening news. If only for a moment, it seemed as though the entire nation was debating federal grazing policy as a tense standoff unfolded between the Bureau of Land Management and one Nevada rancher named Cliven Bundy. The BLM, however, disagreed, and in April 2014 the agency began rounding up hundreds of Bundy’s cattle from the federal rangeland. The agency claimed that Bundy owed nearly $1 million in unpaid grazing fees and fines. The cattle were not only trespassing; they were trampling sensitive habitat for the desert tortoise, a federally protected species. 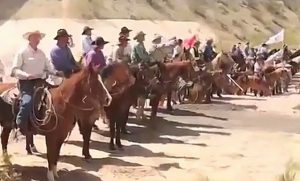 The BLM dispatched hundreds of federal agents along with contract cowboys and helicopters to descend upon the Nevada desert to capture, impound, and remove Bundy’s cattle from federal land.2 When Bundy refused to back down, the situation escalated quickly. Dozens of anti-government activists rallied in support of Bundy to stop the roundup and fight back against the BLM. To many observers in the East, the roundup was seen as a clear example of federal overreach. Within a few days, a full-on range war was brewing in Bunkerville. Mobs of angry protesters and armed militiamen confronted BLM agents as they attempted to corral Bundy’s cattle. At one point, guns were drawn. One protestor, one of Bundy’s sons, was shot by federal agents with a stun gun. The standoff captured the nation’s attention. Almost overnight, Bundy became an icon in conservative media outlets for standing up against an oppressive and powerful federal agency. In other media circles, Bundy was portrayed as a “welfare cowboy” who blatantly disregarded the law and grazed his cattle at the expense of U.S. taxpayers. And to others, he was simply a criminal with a rogue militia gang—a clear indication that the violence and lawlessness of the wild, wild West is still alive and well in the deserts of Nevada. In the end, the BLM backed down, citing concerns over the safety of their employees and the public. The cattle were released back on to the federal rangeland, where they remain today. The range war in Bunkerville gradually defused, and Bundy emerged unscathed. But for Bundy, the limelight did not last for long. A few days later, he was recorded making offhand racist remarks to a journalist and was swiftly denounced by the media. Almost as quickly as it began, the grazing debate—along with Bundy himself—faded from the headlines. The conflict between Cliven Bundy and the BLM transformed federal grazing policy into a salient political issue in the minds of many Americans, if only for a brief time. Bundy’s story, however, is far more complicated than it was portrayed on national television. The narrative that emerged in the media implied that the conflict was straightforward: A rancher refused to pay his grazing fees and, as a result, was nearly evicted from the land. But in fact, the standoff on the Bundy ranch was the product of a longstanding confrontation between ranchers and environmental groups over the nature and security of federal grazing rights in the United States. That debate is embedded within the unique and complex history of U.S. grazing policy. It’s a story that illustrates one of the central challenges facing grazing policy today: how to resolve conflicting demands on the federal rangeland in an era of new and competing environmental values. Consider the more nuanced version of Bundy’s dispute: For generations, Bundy’s family grazed cattle on the vast rangelands of the western United States. Like many ranchers in the West, Bundy had a federal grazing permit, issued by the BLM, which authorized him to graze a certain number of cattle on the 160,000-acre Bunkerville Allotment in southeastern Nevada. 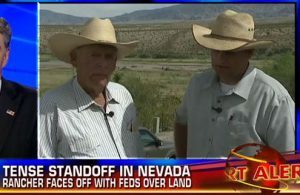 The federal grazing system requires that grazing permittees must own certain private properties that are legally recognized by the federal government as qualifying for federal grazing privileges.3 In this case, Bundy’s right to graze cattle on federal land was dependent upon his ownership of a 160-acre parcel located in Bunkerville, Nevada.4 In effect, his grazing permit was attached to this particular “base property.” Along with the ranch, Bundy also secured groundwater rights, which together with the base property enabled him to secure and maintain grazing privileges to the Bunkerville Allotment. The value of Bundy’s property was enhanced by and dependent upon the public grazing privileges it provided to the nearby allotment. Bundy refused to accept the BLM’s modified grazing permit and continued grazing his cattle on the Bunkerville Allotment. He also refused to pay the grazing fees and trespass fines levied against him. In 1994, the BLM formally revoked his grazing privileges for “knowingly and willfully grazing livestock without an authorized permit,” setting in motion Bundy’s decades-long battle with the BLM.7 After several court orders to remove the cattle and ban Bundy from grazing on public lands—in addition to nearly $1 million in grazing fees and fines owed by Bundy—the conflict finally reached a boiling point in April 2014 when the federal government began to roundup the trespassing cattle. Bundy’s story is not unique. Ranchers across the West increasingly face similar challenges to their traditional grazing use of the federal rangeland. This has contributed in part to a general decline in grazing on federal rangelands and a perception among many ranchers that their future is threatened by the emergence of environmental regulations.8Today, the amount of grazing authorized on BLM land is half of what it was in 1954.9 Bundy’s case is simply the most salient and well-documented dispute in recent years. The problem of the “Gordian knot” is intensified by the vast reach of the federal government’s authority over western lands in general and over western livestock grazing in particular. Federal agencies control nearly half of the land in the western United States, including more than 60 percent of Idaho, 67 percent of Utah, and more than 80 percent of Nevada.11 As a result, livestock grazing in the West is a federal land issue in many cases. Due to the relatively small amounts of private land in the West, along with the region’s arid conditions, which require large amounts of land to sustain livestock operations, western ranchers have relied on access to federal land for forage resources for more than a century. Today, the BLM administers nearly 18,000 grazing permits and manages more than 21,000 grazing allotments on 155 million acres of public lands managed for livestock grazing.12 The U.S. Forest Service also administers a federal grazing program in the agency’s national forests and grasslands, comprising more than 95 million acres of land with nearly 6,000 permittees.13 In 2013, together, these agencies provided 15 million AUMs worth of forage resources for livestock grazing, or enough forage to feed 15 million cow-calf pairs or 75 million sheep or goats for a month. This essay examines the U.S. federal grazing system and explores its ability—or its inability—to resolve competing demands through negotiation rather than conflict. Federal grazing policies in the United States have largely proven unable to reconcile conflicting demands on the western range. In many cases, existing policies may even exacerbate the problem. The central issue, this essay will argue, is the security and transferability of property rights to rangeland resources. In particular, conflicts over grazing on federal lands are the product of poorly defined grazing rights and restrictions on the transferability of grazing permits. Environmental groups and other competing user groups effectively have no way to bargain with livestock owners to acquire grazing rights. Their ability to trade is prohibited or severely limited under existing federal grazing policies. As a result, federal rangelands are too often the subject of conflict, litigation, or regulation, rather than exchange, negotiation, or cooperation. In the sections that follow, this essay explores these challenges and identifies key issues and opportunities for reform. It offers a framework for thinking about how grazing conflicts are resolved, borrowing from a theory known as raid or trade, and explores several efforts by conservation groups and private landowners to overcome the barriers to trading rights to the federal rangeland. The essay concludes by exploring the lessons learned from these limited efforts in the United States and discusses how the federal grazing experience might inform rangeland policy in other jurisdictions. In the process, it suggests several opportunities for reforming the U.S. federal grazing policy to promote more sensible, peaceable solutions to conflicts over the western rangeland. Reposted from Free Range Report.